SEOUL, June 20. /TASS/. Seoul, Moscow and Pyongyang may implement a number of big trilateral infrastructure and energy projects in case peace is established in the region, South Korean President Moon Jae-in said in an exclusive interview with TASS First Deputy Director General Mikhail Gusman for TASS, the Rossiyskaya Gazeta daily and the Rossiya 24 TV channel ahead of his state visit to Moscow. "Russia and South Korea have huge potential as far as economic, humanitarian and cultural exchanges go," Moon Jae-in said. "The potential has not been exhausted yet. 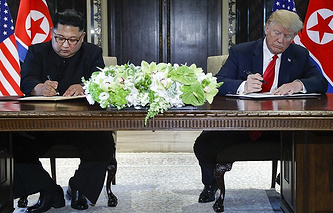 We can involve North Korea in cooperation after permanent peace is established in the region," he added. By way of example, the South Korean president mentioned plans to connect the three countries’ railway networks that would make it possible to deliver goods to Russia and Europe via North Korea. "Once the Trans-Korean Main Line is built, it may be connected to the Trans-Siberian Railway. 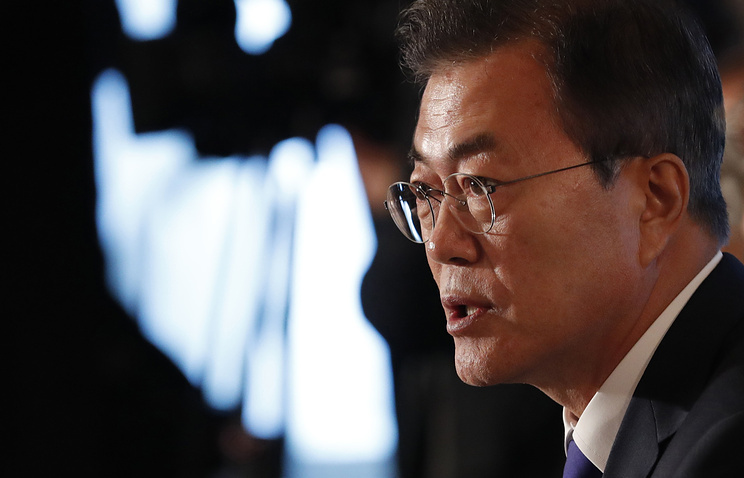 In this case, it will be possible to deliver goods from South Korea to Europe, which would be economically beneficial not only to South and North Korea but to Russia as well," Moon Jae-in said. He went on to say that building a gas pipeline from Russia to South Korea via North Korea was another possibility. According to Moon Jae-in, this gas pipeline could also be used for exporting Russian gas to Japan. "We can also build a gas pipeline via North Korea, so that not only South Korea will receive Russian gas but we will also be able to deliver it to Japan," the South Korean president noted. He also mentioned the possibility of connecting the three countries’ electricity grids, which would create opportunities for further cooperation, particularly with Japan. "We can also establish a powerline that would allow us to receive electricity from Russia. It could also be delivered not only to South and North Korea but also to Japan. Moon Jae-in was confident that "implementing these plans may contribute to the economic prosperity of all countries on the Eurasian continent." Seoul and Moscow are preparing agreements on the comprehensive development of economic cooperation that may be sighed during South Korean President Moon Jae-in’s visit to Russia. "Our countries have established an intergovernmental commission that considers various economic cooperation issues," he said. "Documents that are being prepared may be signed during my visit to Russia," Moon Jae-in added. According to him, the process involves not only the two countries’ governments but interested organizations and private companies as well. The South Korean president stressed that in 2017, he had determined priority areas of bilateral economic cooperation. "They include railroads, gas industry, electricity production, the construction of port infrastructure facilities, agriculture, fishery, ship-building and so on," Moon Jae-in said. He emphasized the need to boost cooperation with Russia in the above mentioned areas, adding that in 2017, the South Korean presidential administration had established the Committee on Northern Economic Cooperation, which is responsible for economic interaction with Russia. Moon Jae-in also stressed that in the near future, Seoul and Moscow would need to agree on a specific action plan for boosting cooperation. "As far as I know, the intergovernmental commission is currently working on such a document and I hope that it will be signed before the Fourth Eastern Economic Forum due in September this year," he said. According to the South Korean president, thanks to increasing economic cooperation, bilateral trade grew by 40% in 2017 compared to the previous year, reaching $19 bln. "I believe that it is only the beginning," Moon Jae-in concluded.